Quarried only in Western Ireland, Connemara marble is considered the national gem of Ireland and boasts 40 shades of green running through the stone. Cynthia Machata, of Antiquity Travelers, brought some beautiful Connemara marble pendants back with her from a recent trip to the Emerald Isle, and gifted one to me. As soon as I saw the stone, I knew it would be perfect for a tutorial I had just purchased, and it would give me a chance to learn a new technique! 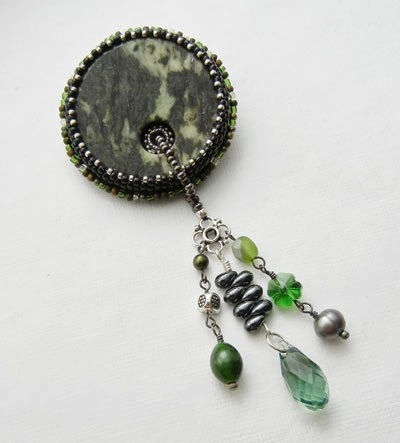 I began by bezeling the marble in black and silver, and, since the stone was already very large, I finished it with a simple, clean edge in various shades of green. This is the first time I’ve added a pin back. Since the stone is rather heavy, I used Jamie Cloud Eakin’s technique and cut a piece of metal flashing (found in the roofing section of any hardware store) to insert between the under- and outer-backing. Epoxy-fortified, it gave the pin back some much-needed extra strength. But I wasn’t finished with my project yet! I created the pin to use as the focal for a Sherri Stokey micro-macramé necklace. I had wanted to try my hand at micro-macramé forever and Sherri’s Multi-Strand Necklace tutorial on craftedu.com seemed a great place to start. I had made a flock of those big-eyed owls of the eighties (one of which my mother actually hung in the family room!) But it had been decades since I’d engaged in hand-knotting and I loved every minute working with Sherri’s modern, minimal design. Micro-macramé is a technique I will definitely return to again. No two pieces of Connemara marble are identical, and mine shows tones of grey, brown-green, olive and a nearly black, forest green. After adding stones, crystals and seed beads from my stash, I’m pretty sure my finished piece celebrates at least 40 shades of green! Much thanks go out to Cynthia, for gifting me with such a unique piece of Irish history! Your piece is gorgeous I love how you made it into a pin and an necklace awesome idea. 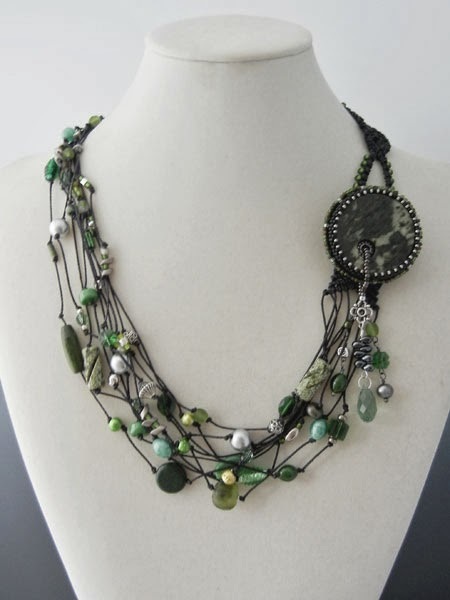 Green is one of my most favorite colors and I love that there is so many shades of green in your necklace to bring out the beautiful shades of green in your Connemara Marble. What a gorgeous and versatile piece! 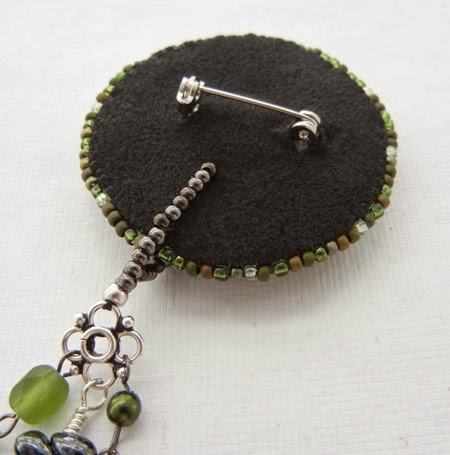 Love that micro-macrame look, the dangle off the pin and the colors...oh those soothing greens of all shades. You definitely get an A+! Its beautiful as a pin but absolutely drop dead gorgeous as a necklace. Beautiful work! Was there a hole in the marble (hard for me to tell from the pics) - I love how the dangles arise from there, and the dangles really add to the necklace. Glad you put it on the side - it's perfect! I'd MUCH rather have 40 shades of green than 50 shades of Grey! Yes, that's a hole. At first I thought of covering it, but then a dangle blended into the necklace seemed fun. The hole was the exact diameter of one of my daisy spacers, so I secured a spacer to the Lacy's, and slipped the pendant on top. Forgot to cut a hole in the flashing, and didn't even think about it until I was sewing the loop from back to front, and my needle hit metal. Used my Dremel to create the tiniest of holes the width of my Fireline and pulled the needle through! Genius! I love problem solving with beads! 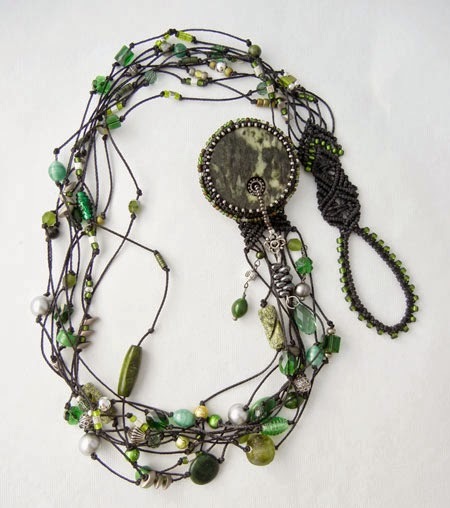 Karin your pieces are stunning - I love the idea of the pin and then adding it to the necklace was ingenious! GORGEOUS!